Climateer Investing: "Beauty Contests and The Term Structure"
The bond premium puzzle arises because the excess yield that investors require to hold a long-term bond is too small in quantitative macroeconomic models. Drawing on the beauty contest literature, this column argues that realistic term premia can be generated by differentiating between private and public information and by introducing strategic complementarities in the formation of expectations. It shows that a significant proportion of US term premia is driven by a beauty contest in forecasting, which rewards investors for being accurate andclose to the average forecast of others. The famous Keynesian beauty contest literature emphasises the strategic complementarity in forecasting the forecasts of others. Keynes (1936) suggested that such a mechanism could be at work in stock markets, with share prices determined not just by fundamentals but also according to how investors think that other investors value particular shares. We believe that a beauty contest mechanism may operate in bond markets too, in which case the term structure of interest rates depends not only on the compensation an investor demands for holding bonds of different maturities, but also on what compensation the investor thinks that other investors will demand for holding the bonds. 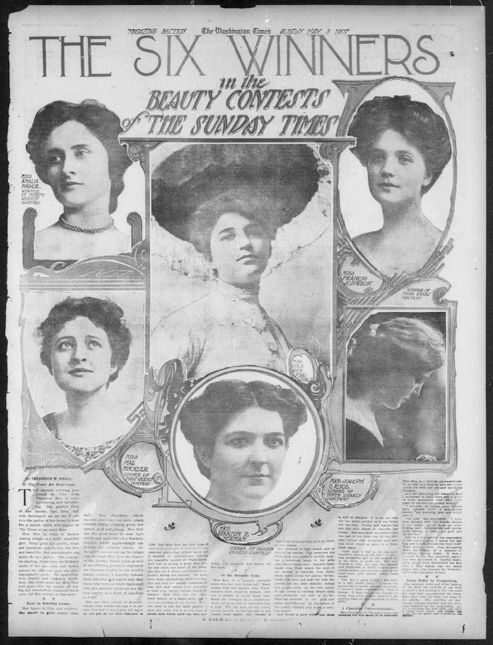 The six winners in the beauty contest of the Sunday Times. The Washington Times, 5 May 1907. National Digital Newspaper Program, Library of Congress. We are far from the first to write about the drivers of term structure. A search for journal articles with the phrase “term structure of interest rates” in the title gives 879 hits in EconLit and 186 hits in JSTOR. Despite this voluminous literature, quantitative macroeconomic models of the type developed by Christiano et al. (2005) and Smets and Wouters (2003, 2007) still struggle to generate risk premia anything like those seen in financial markets. For example, Rudebusch and Swanson (2012) find an average term premium of about one basis point on nominal 10-year bonds in a medium-scale dynamic stochastic general equilibrium (DSGE) model with nominal rigidities and a reasonable coefficient of relative risk aversion. Estimates from Adrian et al. (2013) suggest that the term premium on 10-year US Treasuries between 1999 and 2017 was two orders of magnitude higher at over 100 basis points. *Yesterday's Follow-up: "US companies begin to reduce bond holdings after tax overhaul"